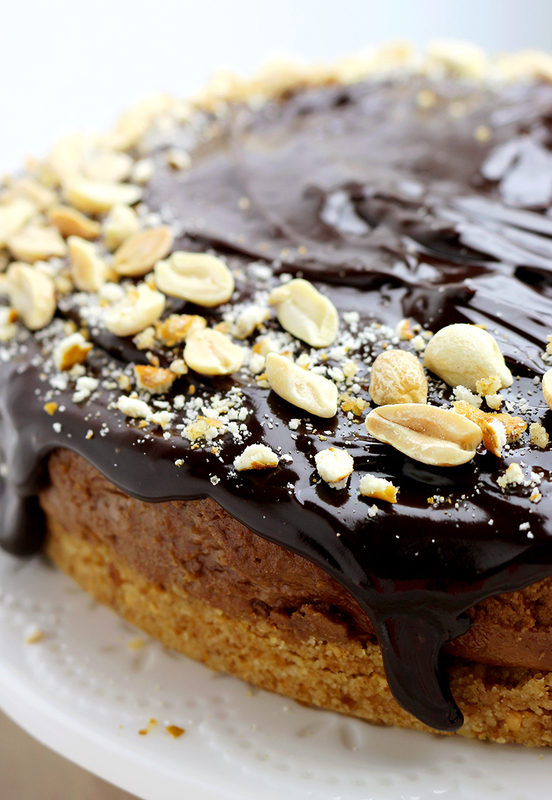 Chocolate + peanut butter = perfect combination. This is one of the recipes that you will always keep. I like no bake desserts, especially when it is hot outside. You can check my blog for other no bake desserts, such as No Bake Strawberry Cheesecake or No Bake Chocolate Cheesecake Bars and ice-creams, of course, such as Homemade Mint Chocolate Chip Ice Cream or Blackberry Cheesecake Ice Cream. 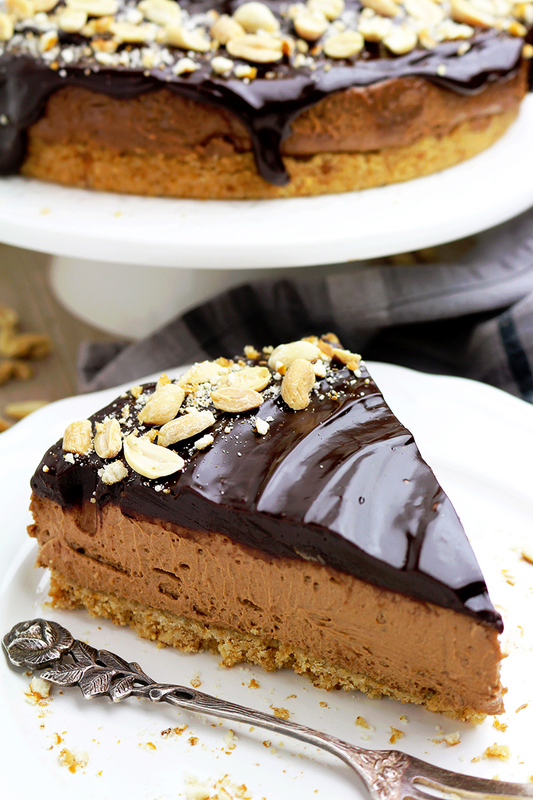 One of the no bake desserts is Chocolate Peanut Butter Cheesecake with Pretzel Crust. 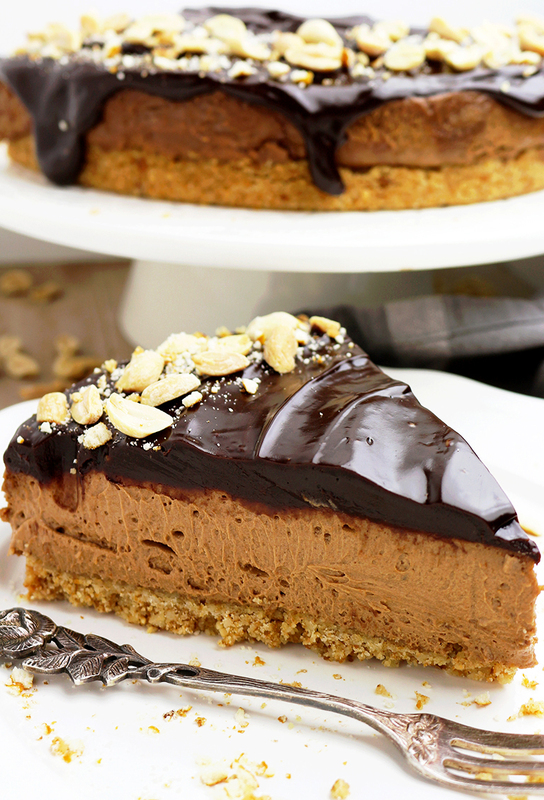 This decadent cheesecake will be perfect for chocolate and peanut butter fans. There is a crunchy layer made of pretzels, chopped peanuts and butter. 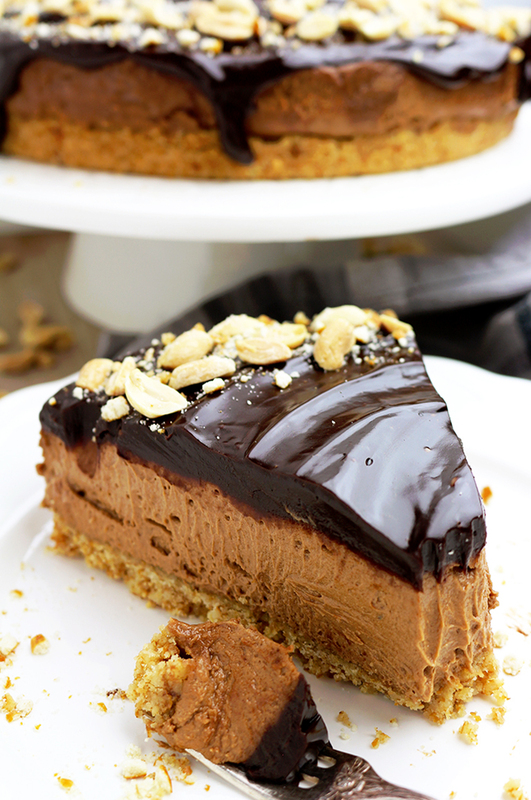 Then, there is a creamy layer of chocolate and peanut butter, with cream cheese and heavy cream. Finally – chocolate ganache. 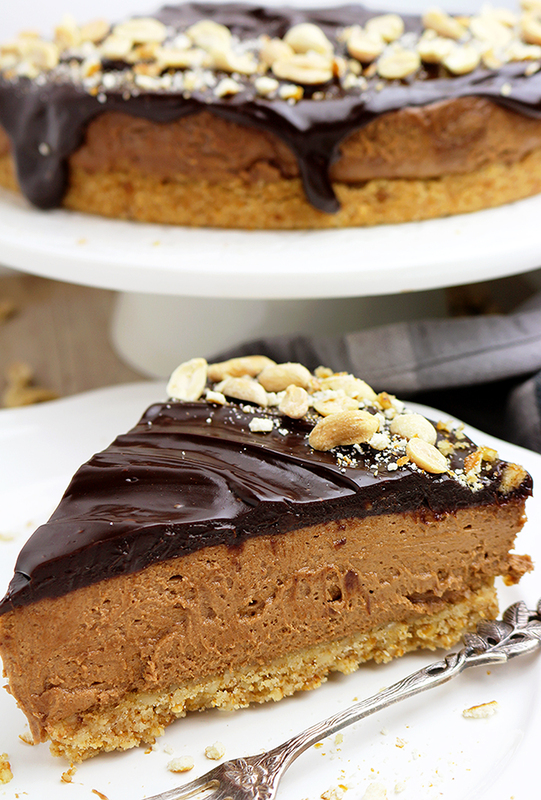 Chocolate Peanut Butter Cheesecake with Pretzel Crust is a great choice for any special occasion or whenever you want to make someone happy. My love for No Bake Peanut Butter Chocolate desserts started with No Bake Peanut Butter Chocolate Mini Cheesecake and continued with Peanut Butter Cookies with Chocolate Chips and Pecans. Preheat oven to 375 F. Line a 9 inch spring form pan with parchment paper or spray with a cooking spray. Put crushed pretzels, chopped peanuts, light brown sugar and butter in a medium dish. Stir until well combined. Spread evenly on the bottom of the spring form pan. Press evenly to make a fine layer, using hands or some firm object. Bake for 5-7 minutes. Melt chocolate chips, following the instructions given on the package and leave aside. In a large dish mix cream cheese and light brown sugar, with an electric mixer, medium speed, for about a minute, until it becomes creamy. Add vanilla, peanut butter and melted chocolate and mix some more, for about a minute, until well combined. In a separate dish mix heavy cream, with an electric mixer, at the lowest speed for about a minute, then for 3-4 minutes at maximum speed, until it becomes stiff. Combine it well with the mixture from the first dish. Spread evenly over the pretzel crust. Leave it in the fridge for at least 6 hours, possibly overnight. Put chocolate chips in a medium dish. Put heavy cream in a small pan, on medium heat and stir occasionally until simmering. Take it off the fire and pour over chocolate chips. Cover it with lid and let cool for 5 minutes. Add 2 teaspoon of vegetable oil. Stir well using rubber spatula, until smooth. Wait for 10-15 min to cool and spread over the cheesecake that has been refrigerated for 6 hours. Sprinkle with peanuts and crushed pretzels. Keep it refrigerated up to 5 days. Sounds delicious. Looks even more so. but what are “crusted” pretzels? Thanks Joanne for your observation. It’s crushed pretzel, my mistake.